Father John Breck (1939- ) is an archpriest and theologian of the Orthodox Church in America specializing in Scripture and Ethics. He has been Professor of Biblical Exegesis and Patristics at the St. Sergius Orthodox Theological Institute (Paris, France), and Director of the Saint Silouan Retreat on Wadmalaw Island, South Carolina, since 1995. Breck received his B.A. in Religious Studies from Brown University (1960), an M.Div. (Master of Divinity, the basic seminary degree for those seeking ordination) from Yale Divinity School (1965), and a Doctorate of Theology from the Ruprecht Karl University of Heidelberg in Germany (1972). In 2003 he was awarded an honorary doctorate from the University of Cluj-Napoca in Romania. 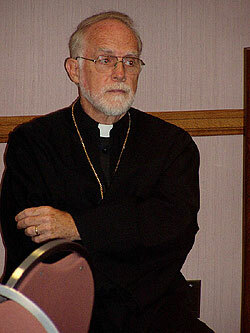 After converting to Orthodoxy from Protestantism, he served as Professor of New Testament and Patristics at St. Herman's Orthodox Theological Seminary (Kodiak, Alaska) from 1975-1978, as Professor of New Testament and Director of Studies at St. Sergius Orthodox Theological Institute (Paris, France) from 1978-1984, and as Professor of New Testament and Ethics at St. Vladimir's Orthodox Theological Seminary (Crestwood, New York) from 1984-1996. God With Us: Critical Issues in Christian Life and Faith. Crestwood: St Vladimir's Seminary Press, 2003. The Legacy of St Vladimir: Byzantium, Russia, America (editor). Crestwood: St Vladimir's Seminary Press, 1997. Longing for God: Orthodox Reflections on Bible, Ethics, and Liturgy. Crestwood: St Vladimir's Seminary Press, 2006. The Power of the Word: In the Worshiping Church. Crestwood: St Vladimir's Seminary Press, 1997. The Sacred Gift of Life: Orthodox Christianity and Bioethics. Crestwood: St Vladimir's Seminary Press, 1999. Scripture in Tradition: The Bible and its Interpretation in the Orthodox Church. Crestwood: St Vladimir's Seminary Press, 2001. The Shape of Biblical Language: Chiasmus in the Scriptures and Beyond. Crestwood: St Vladimir's Seminary Press, 1994. Spirit of Truth: The Holy Spirit in Johannine Tradition: The Origins of Johannine Pneumatology. Crestwood: St Vladimir's Seminary Press, 1990. Stages on Life's Way: Orthodox Thinking on Bioethics (with Lynn Breck). Crestwood: St Vladimir's Seminary Press, 2006. "Life In Christ" Articles by the Very Rev. John Breck - OCA Web site. This page was last edited on November 18, 2015, at 01:09. This page has been accessed 31,935 times.